Barasia is Syrian for Leek. Baby leek to be precise as large leek as we know it in Europe is almost non-existant in Syria. Today's dish is one of a large group of vegetable based "in oil" dishes. In Syria and the rest of The Levant, most vegetables are cooked two ways. One with meat, mostly as a tomato-based stew, served as a main dish with vermicelli rice. 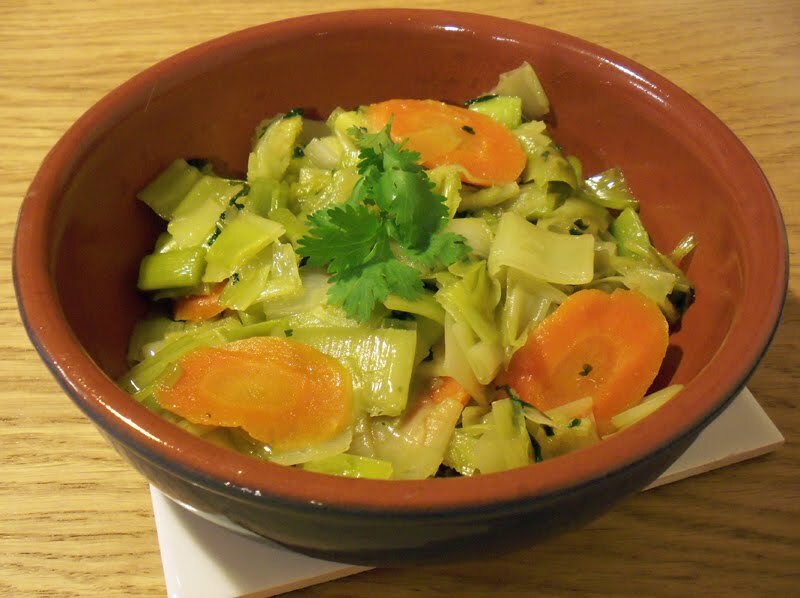 The alternative is vegetables cooked in Olive oil without meat and eaten with Arabic bread. They are served as a side dish or part of a mezze spread. They could be eaten hot, cold, room temperature or at their best slightly warm. Barasia is almost always cooked in Olive oil. To be honest with you, I am not sure if a meat version does exist. I never tried such a dish. So, If you know a Syrian or Lebanese recipe for leeks cooked in meat please let me know and I will give it a go. This recipe is adapted from a recipe given to me by fellow Syrian blogger, Maysaloon. Clean the leeks by cutting the green ends and peeling the outer layer. Chop the leeks into 1 cm pieces. Slice the carrot very thinly to make sure it cooks at the same time as the leeks. Heat the olive oil in a pot and add the leeks and carrots. Cook on high heat for 5 minutes. Add the cumin and salt to taste and turn down the heat. Cover and let cook on low to medium heat for 20-25 minutes or till the leeks fully cooked. Add the coriander few minutes before the end to keep maximum taste. Drizzle with some olive oil if you wish and serve slightly warm with Arabic flat bread. In Hama, we call it "Krrat". There's a meat version. The meat version is served with Arabic bread and lemon juice (no tomato sauce and no rice). I'll give you the exact recipe soon. I am happiest when you do a vegetarian dish! And this one is just gorgeous so I am very very happy! heating the olive oil is not tasty, i think it will add a bitter taste to the dish, warming it would be better. beside , whenever there is olive oil + kezbera , there should be a "toom" and maybe lemon since there is cummon. i never knew what people use barsia for, though i remember mum once made a soup out of it. i do not remember what it tasted like. I'll try ur recipe this weekend. I thought there must be a recipe I don't know that uses meat with brasia. I am looking forward to try your recipe. Thank you for coming by and the nice words as always. I totally agree with you about olive oil. It doesn't tolerate high temperature so you shouldn't heat too much or let it smoke otherwise the taste will not be nice as you mentioned. I agree with you about coriander and garlic as well. I din't use garlic in this dish because barasia has a delicate sweet taste and garlic will over power. That is just me, try it with garlic and let me know how it goes. Beautiful dish and beautiful blog! Love your recipes- I'll be visiting often and definately following! Welcome to my blog and thanks for following. I am glad you like the dishes and I hope you will have a chance to try some. There is some delicious looking dishes on your blog.